I’m becoming obsessed all over again with the Instant Pot I’m still amazed how efficient this pressure cooker can be and how it can turn out great tasting dishes in a matter of minutes (not including the time it takes to get to pressure) with minimal prep…and clean-up is so easy. 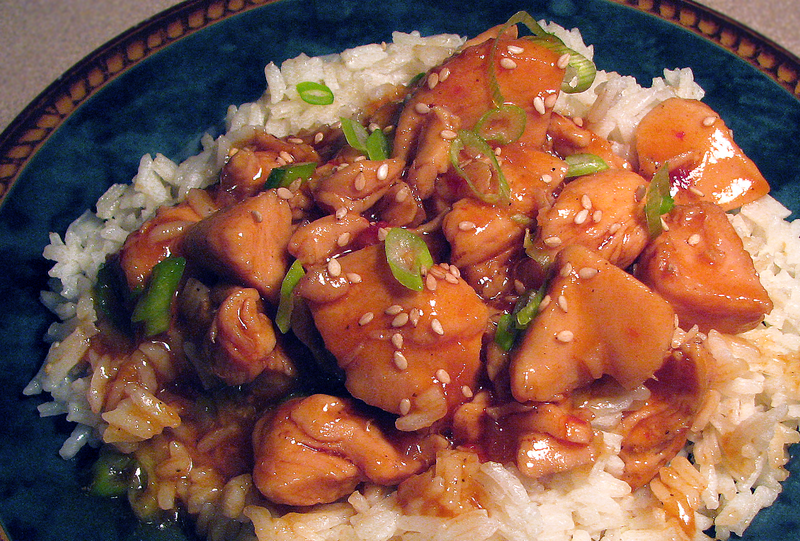 The prep time on the Honey Sesame Chicken was about ten minutes and the actual cooking time was only 3-5 minutes. All-in-all, from start to finish, this was on the table in 30 minutes…and it was as good as any take-out chicken I’ve ever had…just click the Read More below for the printable recipe. And if you like quick and easy spicy chicken dishes with minimal clean-up, you’ll love my Easy Chicken Fajitas in Foil Packet. Another Instant Pot miracle dish...easy, fast and incredibly tasty...better than take-out! Set the Instant Pot to sauté, add 1 tbsp of oil. Season the chicken with salt and pepper and when the pot is hot, add ½ the chicken. Cook, stirring for 3 minutes until lightly browned. Remove the chicken with a slotted spoon and repeat with the remaining chicken. Add another tbsp of oil, the onion, garlic, and previously cooked chicken pieces back into the pot and sauté, stirring occasionally, until onion is softened, about another 3 minutes. Add soy sauce, chili garlic sauce, ketchup, and red pepper flakes to the pot and stir to combine. Cover and set the Instant Pot to high for 3 minutes. When the time is up, do a quick release. Add the honey and the sesame oil to the pot, stirring well. In a small bowl, mix the cornstarch and water together to make a slurry and add to the pot. Select Sauté and simmer about a minute or two until sauce thickens and becomes velvety. Stir in half the green onions. Add salt to taste. Serve over rice, sprinkled with the remaining green onions and the toasted sesame seeds. Serve with Sriracha, for an extra spicy kick.